Suzuki has fired the first salvo in a planned five-vehicle barrage on the market over the next five years. With the introduction of its new SX4 S-Cross - its first launch in more than three years - Suzuki is about to take a first major leap into the burgeoning, larger SUV/crossover segment. It believes it will provide a serious challenge with both style and aggressive pricing to the likes of the class leader, the Nissan Qashqai. The move is a response to what it sees as a sea-change in consumer demand over the past decade. The pursuit of "badges and prestige", has been challenged by the need for practicality and reliability. 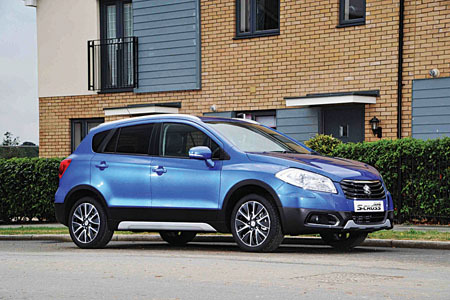 With the SX4 S-Cross, a family-size crossover, it believes it has successfully married driving pleasure with the practicalities of modern life. It expects the new car, which will go on sale here on October 14, to appeal to existing Suzuki owners, from the Swift through to the Grand Vitara. However, it is also confident of chalking up significant conquest business from hatchback drivers of other brands looking to upgrade to what it claims is a more spacious and better-equipped vehicle. The car will come in an entry level 1.6-litre petrol (127g/km, five-speed manual ), priced at €19,995, which would be about €2,000 less than the equivalent Qashqai. The SX4 S-Cross comes with a new Suzuki 1.6 diesel powertrain in 2WD (110g/km of CO2 ) and in 4WD All Grip' (114g/km of CO2 ) - and a new traction control system. There are three specification grades, GL, GL-Plus and the GLX. Suzuki believes the 1.6 GL and GL-Plus diesels will be the biggest sellers here. All models are equipped with seven airbags, ESP, tyre pressure monitoring and daytime running lights. Every GL will have Bluetooth, cruise control and speed limiter, air conditioning, heated door mirrors, and black protective skid plates. The GL diesel adds six speed gearbox and alloy wheels, with stop-start and hill-hold as options. And the GL-Plus adds fog lamps and roof rails, with stop-start as an option. The top spec GLX will have parking sensors, All Grip, leather seats, heated and retractable mirrors, headlamp washers, and privacy glass. Suzuki believes car buyers these days prioritise styling, roominess and safety and it says the SX4 S-Cross has all three in abundance. It must wait until October for what it expects will be a five-star Euro NCAP rating. A big feature of the S-Cross is its all-new four-wheel drive All Grip system, with four modes selectable from a centre console to adjust traction and control to suit differing driving environments, auto or normal, sport and snow for coping with slippery or muddy roads. A lock mode creates permanent four-wheel drive for negotiating deep snow, sand and other more challenging conditions. Suzuki says its boot boasts 20 litres more space than the Qashqai and substantially more than the Opel Mokka, while Suzuki claims that S-Cross emissions are the lowest in the segment. It also boasts that its engines are the most economical and its cabin the most spacious. All cars have a unique panoramic double-sliding sunroof, providing clear air space for those summery days on the open road. With models that have sat-nav, DAB radio will also be installed and all S-Cross models will have a service interval of 20,000 kilometres, an increase of 5,000km over current models. On first sight the SX4 S-Cross stands proud and tall, exuding muscle and brawn, while more defined styling lines give it a more sporty and rugged appearance than some class-leaders. On a series of short test runs over motorway and rural roads, the car impressed with solid and responsive handling, ample agility on narrow country byways, hard-wearing interior finish, ease of access to controls, and ample space back and front. Clearly, rejuvenated Suzuki's brash claim that it is about to seriously attack this segment of the market does not appear to be misplaced.